Kanpur is surrounded by Hamirpur in the south and Unnao in the north-east and it is also flanked by Ganges in the north-east and Yamuna in the south. 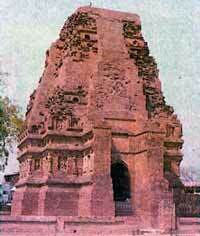 History says that Kanpur was originally referred by the name Kanhiyapur after Lord Krishna.Kanpur was founded by the Hindu King Chandel.The town of Kanpur remained insignificant till the 19th century. It became significant only after the defeat of the nawaab of Awadh by the British. The British started establishing themselves in Kanpur and soon a treaty was signed between the Awadhs and the British. This led to Kanpur becoming the most important military station of British India and it was declared a district on 24th March 1803. Ganga Mela - This is a festival celebrated after holi for a period of about seven days.Ganga Mela is mainly celebrated in memory of the revolutionists who were prisoned during 1857 revolution and later released by the British.Jhoola Festival or Swing Festival - This is a traditional festival celebrated in the Dwarka Dhish Temple and the idols Radha and Krishna sitting on a beautifully ornate swing are worshipped. This festival falls in the sacred month of Sravana.This spring festival s visited by number of devotees and tourists. This church in Kanpur is popularly known as the All soul's cathedral. 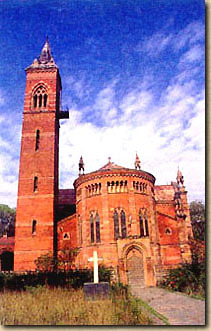 It was built in memory of the British who lost their lives in the 1857 revolt. The most attractive feature of this church is that it was built in the Lombardic Gothic style. The cathedral also houses a memorial garden towards its east. This temple is mainly dedicated to Lord Mahavira and the 23 Jain Tirthankaras. 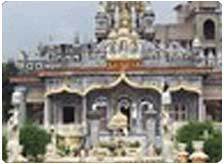 Jain Glass Temple is one of the holy places for the Jains in Kanpur. It is located in the in Maheswari Mahal. The temple is known for its glass and enamel works. This temple is situated in the heart of the city near Pandav Nagar and houses the statues of Lord Krishna, Lord Shiva, Lord Hanuman, Lord Vishnu, and Lord Rama. It attracts a major tourist crowd for its art and architecture. The towers of the temple is fully decorated with lights and thus in the night it gives a beautiful sight. 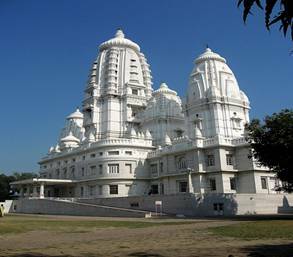 This temple is situated near Kamla Tower in Kanpur and is dedicated to Lord Krishna. The temple is famous for the Jhoola or Swing festival held in the month of July-August. Jajmau known as Siddhapuri is a very ancient mound located towards the east end of the city.This was supposed to the kingdom of Yayati dynasty.Many antiques were got after the excavations of this place in 1957.Now this place is become one of the most important site to be visited by the tourists for Jajmau houses the Siddhnath and Siddha Devi temples and the mausoleum of Makhdum Shah ala-ul-Haq, the famous Sufi saint, built by Firoz Shah Tughlaq in 1358 and a mosque built by Kulich Khan in 1679. 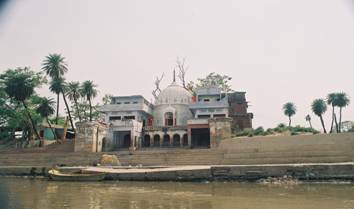 Massacre Ghat near the bank of river Ganga is situated in the Kanpur Cantonment Area. which is also popularly referred to as the Sepoy Mutiny of 1857 or the first war of Indian Independence took place. Gautam Buddha Park is one of the latest picnic spot in Kanpur,located on the way to IIT Campus.This is very recently constructed park with lawns and small rides for children. To the west of Phool Bagh is located the Nana Rao Park. It is the site of the 'Bibighar’ of 1857. The Park was renamed as Nana Rao Park after independence. This is one most favourite spot in Kanpur located near Agricultural College.Kamala retreat entertains the visitors by a boat ride and it also has a small zoo.The main attraction of this retreat is the swimming pool which produces artificial waves. Kamla Retreat also houses a museum which has a good collection of historical and archaeological artifacts. 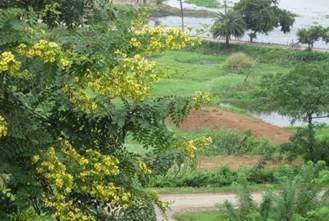 Moti Jheel Park is a model involving old and traditional styles of building water reservoirs. The visitors get an ethnic idea of reservoir when they visit Moti Jheel Park. To add to the attraction a children's parks and recreation and relaxation grounds have been built around the area surrounding the Moti Jheel Park. 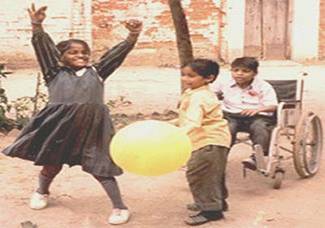 This is located in the Benajhabar area which is close to Kanpur medical college. Phool Bagh houses the Ganesh Shanker Vidyarthi Memorial building occupied by the Orthopaedic Rehabilitation Hospital popularly referred as Ganesh Udyan. 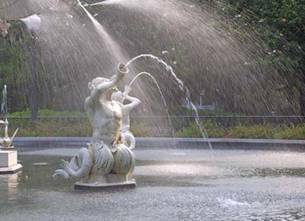 This bagh is situated on the Mall road which is in the prime heart of the city. This zoo which is located in the Allen forest is of very much nterest to the people who love wild life. 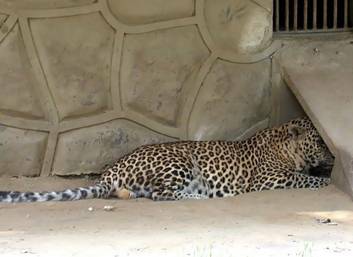 It is supposed to be one of the best zoos in the country for it houses rare wild animals and avian species. Not only animals but the zoo is also known for special varieties of trees like Neem and Prosopis. The Allen Forest Zoo is equipped with a tram which runs inside the zoo. Apart from this there are cultural programmers held in the campus once in a while. This bird sanctuary which is of very must interest to bird watchers for during the month of December you can get to see rare Siberian migratory birds like Pintain, Pigeon, Common teal, Shoveller, Pochard, Coot, Purple Moorhen and others. 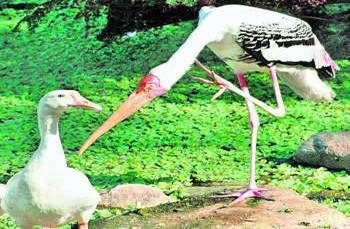 Nawabganj Bird Sanctuary is situated at a distance of about 43 km from Lucknow and in the Lucknow-Kanpur highway. 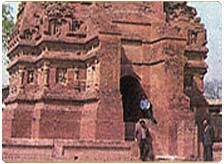 Bhitargaon is known for the architecture of its brick temple dating back to Gupta era, 600 AD. This is the first shrine with a shikara and is situated at a distance of about 59 km. in Ghatampur tehsil. The shopping list in Kanpur includes leather items like Suitcase, Bags, Airbags, Purses, Wallets, Jackets, Belts, Gloves, Football, Volleyballs, Basketballs, Shoes and Saddle.It also has different export varities of leather like Italian leather, Spanish Leather, French Leather and Suede leather.The main shopping area here are the Mall, Birhana Road, Gumti No.5, Parade, Naveen Market, Matson Road and P.P.N. Market. There are few emporiums run by the State Government of UP. The Mega Mall near city center, The Rave at Moti Lal Padam pat Udyog Sarvodaya Nagar, The Rave 3 on Parvati Bagla Road, The Zee Mall, opposite to Christ church College, Nadri Bazar,Vishal Mega Mart, Salasar, City Fashion Mall, SGM Parade are some famous Malls for shopping in Kanpur. The Kanpur airport is situated in Chakeri which is in the outskirts.Kanpur offers domestic flight services to several cities in India. The rail network of Kanpur is well connected to Delhi, Kolkata, Mumbai and other parts of India. Kanpur Barrack is the main Railway station in Kanpur that falls on the Grand Chord route. Various Expresses and Super Fast trains connect Kanpur to the rest of India. There are number of public and private buses to and from Kanpur.Uttar Pradesh State Road Transport Corporation runs a fleet of well-maintained buses apart from the luxury coaches offered by private operators.